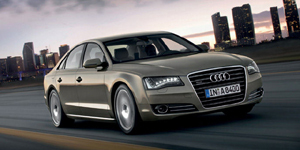 The Audi A8 is completely redesigned for 2011. The 2011 Audi A8 preserves the aluminum chassis of its predecessor and quattro AWD. With its impressive combination of high performance and high technology, the Audi A8 is a superbly capable luxury cruiser. A long-wheelbase version is available.